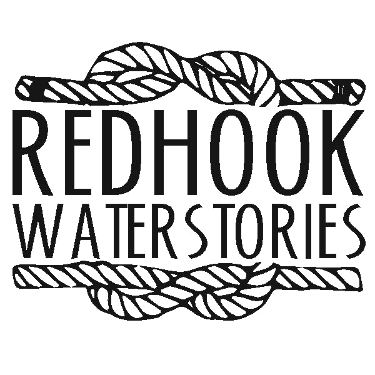 Hurricane Sandy was a destructive example of Red Hook WaterStories. This section “resiliency: flood prep” is an effort to help Red Hook better prepare for future floods. For more about PortSide NewYork’s resiliency experience, read the final section. 1. Advance preparation is essential! There is no one size fits all! You have to craft a plan based on your specific needs, assets, family and/or business. A plan will be different if you own a home and have to secure utilities in your cellar than if you are a tenant on a high floor, whether you own a car or not, or if you have a medical condition that could be affected by loss of electricity or heat, etc. 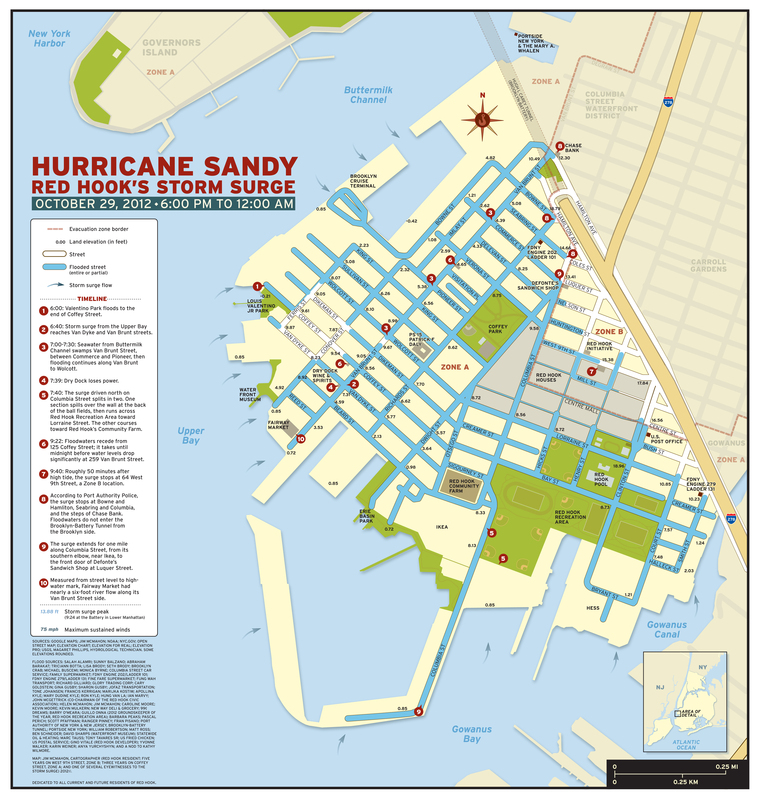 Business owners in particular have a lot to do, so check out Red Hook-specific emergency planning guidelines created by SBIDC with consultants they contracted. When to start: You should create a plan now – when there isn’t a crisis, and you can think through steps clearly. You need to start executing your prep plan AS IF a hurricane will hit before it is certain that it will hit. For most people, you will NOT have enough time to do everything at the point it is certain that a flood will hit. YES, this means you could do prep work, and the hurricane fizzles out or turns away – but better safe than sorry! Got it? Go to 4, 5, 6 to prepare. June 1 to November 30 is hurricane season. Sandy hit the October 29, towards the end of the season, so don’t let your guard down in the fall. See NOAA’s National Hurricane Center webpage for live updates and explanations. NOAA also has very active Facebook pages and Twitter feed. It helps to understand marine weather and how tides and winds affect flooding. More on that in our blogpost Know Your Marine Weather. Flooding will be worse if it occurs at high tide. There are two high tides a day. You need to know the time of high tide in Red Hook. High tide is NOT at the same time in all places in New York City. That is because high tide is when the ocean comes in and rises to its peak flood before turning around and heading out until low tide, when the process resumes again. This means that high tide will hit ocean communities such as the Rockaways before it reaches Red Hook. To see that in a shorter distance and closer to us, tide times are given for two stations near Red Hook: The Battery (the tip of Manhattan) and Gowanus Bay (the southeast side of Red Hook). There is a 12 minute difference between high tide at the Battery and GowanusBay. Some high tides are higher than others. Tides are highest right after a full moon or a new moon which is called a spring tide (which has nothing to do with the season spring). Tides ARE higher in early Spring when the snows upstate are melting and sending lots of water down the Hudson River to us. Fortunately, Spring melt season is not hurricane season, but we mention these variables to explain why water heights at a Red Hook pier can vary so much over the year. The warnings about Irene the year before were not wrong; the hurricane changed. Hurricanes are like the tantrums of small children; they can rush towards you and suddenly turn away. They can escalate as they approach or fizzle out as they reach you. Irene turned away from New York City (but slammed upstate). Irene also did not hit at high tide in Red Hook. If it had, we would have had more flooding. In Red Hook’s case, we have the risk of water coming UP FROM THE GROUND, not just seawater coming in. That’s because large parts of Red Hook are landfill built over former marsh and buried streams. Many cellars flood during heavy rains when those buried streams come back to life. Ask about this before you buy a building or rent a storefront and plan to use its cellar for storage for your business. Lastly, Red Hook suffers the risk of a third source of water, overflowing sewer drains and backups on sewers lines. That’s because the sewer system collects water up in Park Slope, Gowanus and Carroll Gardens and loops through Red Hook on the way to a sewage treatment plant in the Brooklyn Navy Yard (called the Red Hook Wastewater Treatment Plant because original plans were to locate it here). When the flow of sewage, supercharged by heavy rainfall, hits the lowlands of Red Hook, it wants to come out and does. Other parts of Red Hook WaterStories have information on how Red Hook was made by filling land over water. Red Hook is lucky to have a resident cartographer Jim McMahon who took it upon himself to research Sandy flooding here and create a map. It’s a good idea to study it when making your flood prep plan. Prepare your go bag. If you are staying, have food, water, flashlights, batteries, a radio, essential documents. Know your evacuation route and options The city has evacuation info. Documents: Move important documents above the flood level. Best is to get essential paperwork to a high dry place or backed up in the cloud before a flood. Wet paperwork can be saved; there are solutions. Don’t throw out paperwork you may need. Invoices, bills, all sorts of records may be needed to get disaster aid, loans and more. Toxic stuff: If you own a home, move household chemicals above flood level to prevent them floating and spilling. Get your cars out! Red Hook is lucky to have high ground nearby in Carroll Gardens and Park Slope. However, remember, to reach Park Slope you have to cross the flood zone of the Gowanus Canal; so get your vehicle out of here before the canal area floods or you will have to drive all the way around Gowanus. Medical: A managed condition can blow up into a critical condition if you don't prepare. Do you have medications that need to be refridgerated or devices that need electricity? If so, you need a back-up plan. Do you or a family member have mobility issues for medical reasons? If so, you need special measures to evacuate or stay in place. Insurance: For good advance planning, you need the right insurance. See section 7. One submerged building meter can take down an entire block. Power is essential for rapid recovery. A concern articulated in the NY Rising committee is that if most buildings in Red Hook do not meet FEMA resiliency standards, the chances for future hazard mitigation funding may be reduced (eg, why would they want to keep paying to fix up an area that doesn’t make good efforts at prevention). Temporary flood barrier solutions may be helpful if you don’t own the building, and especially if you have a business in a rented storefront. There are commercial flood barrier products that plug windows, doors and cellar hatches. See pages 31 to 51 in a Storm Preparedness Powerpoint created by SBIDC and The Dewberry Group. Note, sealing up foundation leaks is important if you have valuable things in your cellar. That kind of work cannot be done with a quickie off-the-shelf installation. This takes advance planning and execution time. For a do-it-yourself version, there is the story of one Van Brunt Street business “Metal and Thread” that kept Sandy water out of their storefront by covering the front with plywood, lots of caulk and sandbags, and welding on some reinforcing cross bars – about $500 worth of supplies from Home Dept or Lowe’s. The business has since left Red Hook, but you can hear their story here. See Floodsmart.gov. Both homeowners and renters need flood insurance if they live in a Special Flood Hazard Area. "SFHA." Red Hook community members created an emergency plan to cover the 72 HOURS BEFORE AND AFTER an emergency called Ready Red Hook. This plan is for all emergencies, not just floods. PortSide NewYork is focused on floods as the waterfront is our mission and area of expertise. 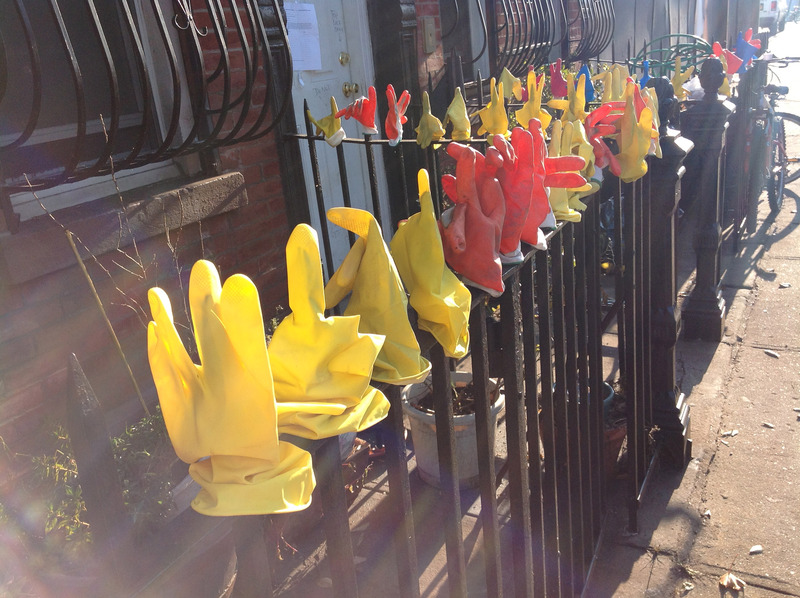 Resilient Red Hook meets the 2nd Monday of the month at 6:30pm, usually at the Kentler Gallery at 353 Van Brunt Street. This was formerly called NY Rising, and founded by a program created by New YorkState, by the Governor’s Office of Storm Recovery, in response to the damage of hurricanes Sandy, Irene and Lee. The Governor’s office appointed members of the Red Hook community to create a resiliency plan with three million dollars. The State provided funding for consultants to support the committee, which met from September 2013 until April 2014 and created a plan. NOAA hurricane center tracks storms and presents data clearly. A few hours before Sandy, they predicted a devastating surge off in Red Hook. They predicted a surge of 12’ for lower Manhattan, which got over 13’. Floodsmart.gov. the official site of the National Flood Insurance Program. Homeowners, renters, businesses need flood insurance if they live in a Special Flood Hazard Area (SFHA). NYC’s Office of Emergency Management (OEM) has coastal flood prep info, a notification system for all hazards, called Notify NYC, customizable by zip code, an Advanced Warning System for organizations that serve the access and functional needs community and the Hurricane Evacuation Zone Finder, among other resources. FloodHelpNY, launched September 2016, is the portal through which homeowners can access information about eligibility for the Residential Technical Assistance Pilot Program (RTAPP), which was proposed through Red Hook’s NY Rising Committee and others and is now being implemented by the Governor’s Office of Storm Recovery GOSR and the Center for New York City Neighborhoods. This pilot program allows homeowners to find out whether they qualify for the program (we heard they were accepting 1,600 homeowners for the pilot). If a homeowner qualifies, they will receive a free resiliency audit of their property, retrofitting advice and financial counseling. They will also receive an elevation certificate, if they don't have one - also for free. You are responsible for your own plan. PortSide NewYork accepts no responsibility for your success or failure. PortSide, like most maritime entities, prepared for Sandy for days. Our first mission was to protect the historic ship MARY A. WHALEN (172’ long, 613 gross tons) from damage or from breaking free and damaging the property of others. There is info on how we prepped over four and a half days here. Carolina Salguero, Peter Rothenberg, and cat Chiclet rode out Sandy on the ship, and the surge hit here around 8pm, Monday, 10/29/12. Carolina and Peter came ashore on Wednesday afternoon, saw the extent of damaged and set up a Sandy recovery aid station. This opened Friday morning at 351 Van Brunt thanks to Realty Collective’s making their storefront available. PortSide ran this aid center for a month and then ran a virtual aid station for months. We ran monthly Sandy victim meetings for several months and offered info privately to many people who contacted us. Our experience helping hundreds of people is part of what informs our resiliency work. April 2013, Carolina Salguero and PortSide NewYork received a White House “Champions of Change” award for Sandy recovery (protecting the MARY A. WHALEN and offering Sandy recovery services). We also were honored by the NYS Senate. Senior member of the federal disaster response team from FEMA, NOAA and the EPA came to meet with us after hearing Salguero speak at the White House awards. PortSide's our conversations with the feds, along with attending many public resiliency planning meetings, helped PortSide refine resiliency plans we had been hashing out. One of those is a vehicle evacuation plan for commercial vehicles (which are not allowed to park on the street overnight) and for vehicles owned by individuals. At the 2016 Red Hook Hackathon, Red Hook worked with a hacker team to create a working model of a vehicle flood evacuation plan. PortSide seeks support to bring this concept to business organizations and to the City and then implement the concepts. Carolina Salguero, PortSide’s Founder & President, was appointed by the Governor’s office to Red Hook’s NY Rising Committee, part of the NYS resiliency program to make communities more resilient. The Red Hook committee had to create the plan mentioned above. Scroll down on this page to find several related links about work she did for the committee with PortSide staff support. The NY Rising committee continues to meet and as of 2017 is called Resilient Red Hook, and you can join if you are a member of the Red Hook community.